Linda Bhreathnach and Patrick Bergin. 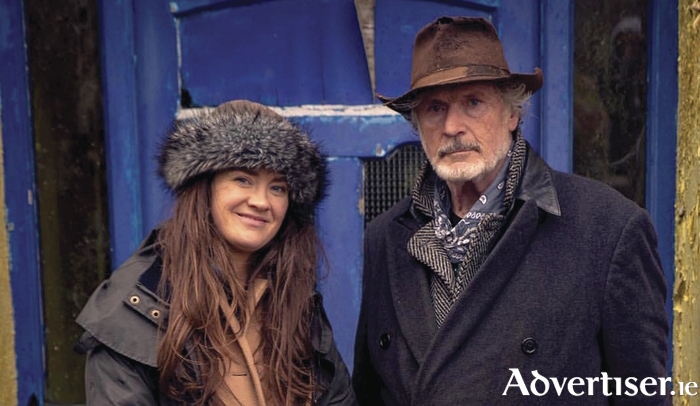 LINDA BHREATHNACH, who impressed at last year's Galway Film Fleadh with Adulting, returns with her new film Native, starring Patrick Bergin, which will be screened at the 2017 fleadh. Native is Bhreathnach's adaptation of the short story H91 Arís by Bridget Bhreathnach, published in irisComhar in 2016. It is directed by Linda and co-produced with Marina Yarnell Donahue, California. “The story is about emigration and homecoming,” says Linda. “I wanted to create a film that could be understood by anyone regardless of background or language. It deals with the sadness and loss inherent to life, but also the potential to transcend suffering and to find beauty. Patrick Bergin’s character leaves Ireland as an economic migrant to return many years later to find an abandoned home." Linda says she was inspired to create the film due to the current global migrant and refugee crisis. "After I volunteered in the refugee camps in northern France, I saw many similarities in what was happening for refugees today and what has happened in the history of Ireland,” she says. The film also stars Colm Ó Mainnín from Ros Muc. It was shot in Ros Muc and Galway city and features an original score, composed and produced by Galway-based Catalonian musician and composer, Moises Mas Garcia. Galway actor Seán T Ó Meallaigh, nominated for an IFTA Award for Best Actor for his role in An Klondike, was director of photography and editor.